Many a guitarist has wondered why there is sometimes 'wow' when a capotasto is set on the neck of the guitar. The reason is bad capo. When you press the string in contact with the fret, your aim is to allow only the section of the string from the fret to the bridge to vibrate. But a small part of the vibrations succeed in creeping over the fret. The material of your fingertip is ideal for damping those vibrations. But if, instead of the soft fingertip, the string is pressed by a capotasto with a hard surface, it reflects vibrations back (as a fret or a bridge bone does). Again, energy moves over the fret, the sound is combined with non-harmonic vibrations and the string howls. The most important properties of the capo are the quality of its surface and the amount of pressure against the strings. The surface must be soft enough to damp the vibrations and thick enough to allow for the different diameters of the strings. The pressure must be sufficent, but not so great that you are unable to tune the guitar (the tension of the capo can be adjusted). On the treble side of the guitar neck the capo must be shallow; it must not be allowed to stand out, or it will prevent you from moving your left hand freely. These requirements, coupled with ease of operation, together make the ideal capotasto. The structure of the capo is seen in the longitudinal section of the illustration. The easiest way of drilling the holes (if you have not tools of professional quality) is to drill first a 40 mm deep hole with the 3 mm bit. Then enlarge the hole with the 6.5 and 5.5 mm bits (luthiers use drill bits of conical form). After that, drill the 1.5 mm hole from the opposite direction. After forming the wood, glue the leather to it and cut the leather to the right size with the razor blade. Shorten the tuning peg so that the diameter at the tip is 5.5. mm. Drill a 1.5 mm hole through the tuning peg. Set she string, which should be about 110 mm from the capo frame to the peg. 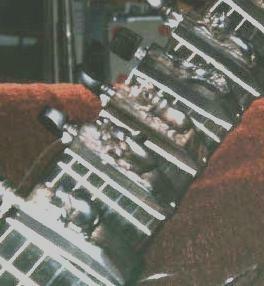 Note that the shape and size of the tuning peg may be slightly different from the one above, in which case you must alter the diameters of the holes. Last but not least, decorate your capo. On the left two simple capos built by me (the lowest ones), and few others. 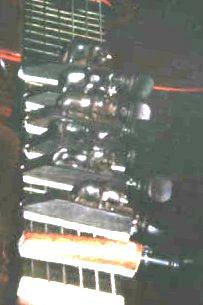 On the right several capos built by African masters with animal figure decorations.